Muddy Hell – Little Devils Kids Race is a dedicated 2km kids obstacle course that will have your kids runnings, crawling, climbing and carrying thier way through mud, dirt and water to get thier very own Little Devils kids medal. All little devils have unlimited play on the Muddy Hell inflatable obstacle course. More info? See the FAQ below. Wave times start at 10am on Saturday and 9am on Sunday and are spread out to ensure the course doesn’t get congested after that, you will be allocated a wave within the time block you chose at booking . Wave times are allocated in hour blocks, you will be allocated a wave start time within that hour block this means you may get a start time in any of the 15 minute intervals inside that hour you chose. If for any reason your wave time has to change you will be notified by email. Waves are of limited sizes unless a group purchase is arranged with Muddy Hell, large groups should book early to ensure kids are in the same wave time and avoid disappointment of the event selling out. 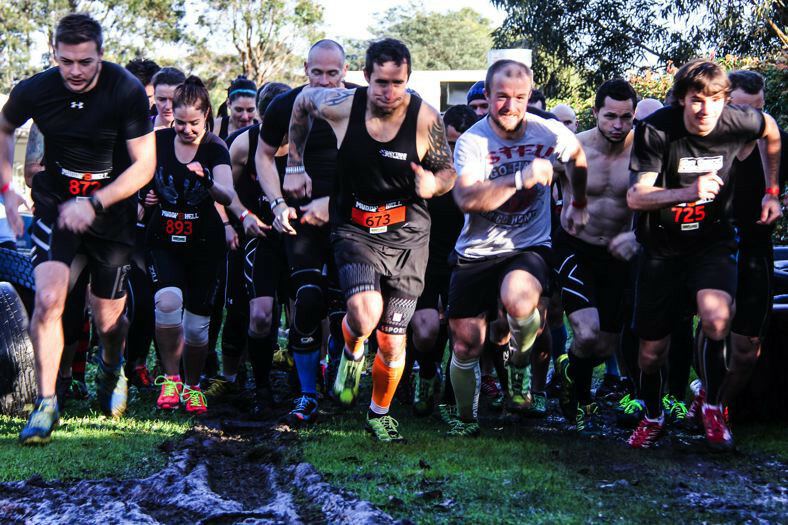 Due to the nature of running events Muddy Hell will not provide cancellations or refunds of tickets for any reason. Tickets can be transferred to another person or a future event, tickets will only be transferred to a future event if a valid medical certificate is provided showing a legitimate physical injury (ie, not sick, flu etc). All inquiries to transfer must be received at least 72 hrs before the event begins and must include the medical certificate. Volunteers are the backbone of what we do and without them our events just would not happen. If you would like to volunteer at Muddy Hell then please complete our Volunteer Application Form and run in the volunteer wave or earn FREE registration for the next Muddy Hell event of your choice. Enter via the Penbank School driveway and follow the appropriate signage. Look for the Muddy Hell flags on the day. Bring yourself, clothing and shoes you don’t mind getting muddy, clean clothes to change into, a towel for your shower at the end and a plastic bag for your dirty gear, oh and dont’ forget cash for some sweet merch and some of the awesome food and drinks on offer in the festival area. the most fun and rewarding obstacle course you have ever done. Can Little Devils do more than 1 lap? Yes they can, Little devils can do multiple laps for a bigger challenge but please make sure they only take 1 medal no matter how many laps completed. Can adults run with the kids? Absolutely yes they can. Adult are more than welcome to run along next to the kids at no charge (Little Devils Course Only). We only ask that adult do their best to not get in the way of other kids, knock little ones over, or have a heart attack trying to keep up. Book your tickets to hell before they sell out. Absolutely. We have trained medical staff on-site ready to assist and have all the appropriate insurances just in case.